Local TD, Denis Naughten today helped plant the first of thousands of trees as part of the Great Green Wall initiative, an African-led movement with the ambition to grow an 8,000km natural barrier to stop the progress of the Sahara desert right across the entire width of Africa. As part of this initiative the Society of African Missions and the Irish Tree Council have developed the Laudato Tree project. The Laudato Tree project was formally launched by Denis Naughten on 8 August 2018 and aims to contribute to the Great Green Wall initiative by linking the planting of trees in Ireland with increasing support for the planting of trees along the Sahel region of Africa. The first 13 trees to be planted in Ireland were planted today by Denis Naughten TD, Fr. 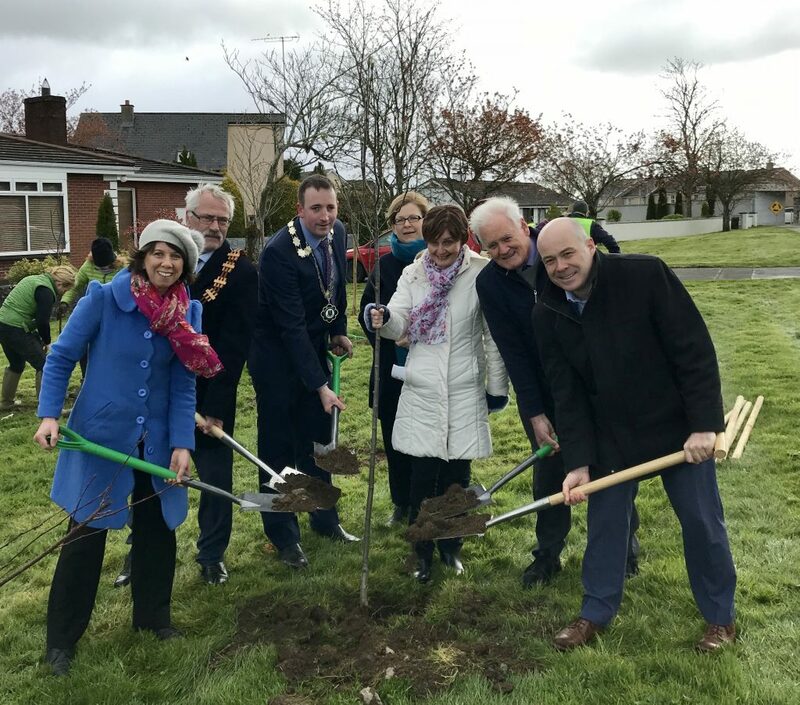 Maurice Henry, SMA, Joseph McConville, President of the Tree Council of Ireland, with the assistance of the Cathaoirleach of Roscommon County Council, Cllr. Ivan Connaughton, Cllr Kathleen Shanagher, Cllr Orla Leyden and Sarah Scott on behalf of Roscommon County Council. Commenting on his own support for the wider Great Green Wall initiative, Denis Naughten pointed out that as Minister he had progressed this initiative with the Executive Secretary to the UN Convention to Combat Desertification (UNCCD) . “I have conveyed Ireland’s support for the important work of the UNCCD in progressing the Great Green Wall initiative. I also allocated funding of up to €1.2 million to provide a solid foundation for the further development of this initiative within the UNCCD, to take this great concept and put a roadmap on it, towards delivering the project by 2030”. “I am personally attracted to the Great Green Wall initiative because of the global challenge we have in relation to climate migration. In its recent Groundswell report, the World Bank stated that 140 million people could be forced to become migrants because of climate change by 2050. We are seeing this on a micro scale here in the West of Ireland where families who have lived for generations in their homes have been forced to move due to flooding”. “This initiative is about growing a world wonder; once complete, the Great Green Wall will be the largest living structure on the planet, 3 times the size of the Great Barrier Reef. But what is really great about this is that the Wall promises to be a compelling solution to the many urgent threats not only facing the African Continent, but the global community as a whole – notably climate change, drought, famine, conflict and migration” concluded Denis Naughten. The Society of African Missions inaugurated the Laudato Tree project in March 2018. Laudato Tree was formally launched in Roscommon on 8 August 2018 and aims to contribute to the Great Green Wall initiative by linking the planting of trees in Ireland with increasing support for the planting of trees along the Sahel region of Africa. Denis Naughten TD, Joseph McConville, President of the Tree Council of Ireland & Fr. Maurice Henry, SMA planting the first 13 trees of the Laudato Tree project with the assistance of the Cathaoirleach Cllr. Ivan Connaughton, Cllr Kathleen Shanagher, Cllr Orla Leyden and Sarah Scott on behalf of Roscommon County Council.